In line with my posts about how executives fall up, I thought I would put in a word or two as to how people get promoted, some justly deserved and others into their level of incompetence (Thanks Laurence J. Peter). This is true of all businesses, not just advertising. People get promoted for both good reasons and for bad ones. Often, people get promoted because they simply earn it. They assume the next level long before it is given and the promotion is anticlimatical. About a year ago, I posted about how to get promoted and covered the anticlimactic promotion. Promotions come in different ways. Initially, in all businesses, one must pay dues. After a certain amount of time in grade, promotions come pretty much automatically. Most are based both on time in grade and merit. But there comes a time when other factors kick in which determine a person’s career trajectory. Sometimes, people manage up well. They have mentors to whom they are loyal and those mentors like to bring these people along with them because they trust them and know that they will do their bidding. Sometimes, especially in advertising, people are lucky enough to get on growing accounts. As the accounts grow, they grow. This is especially true if there is a client with whom one is joined at the hips. As one gets promoted, so does the other. In law firms, he who bills the most gets promoted. Ditto advertising. If an account is big, provides lots of income and is profitable, agencies don’t like to upset the apple cart. But as the Peter Prescription goes, someone who is good on one account may not be good on several accounts where the skills required to run those businesses are different. People get promoted when they have have ideas; make suggestions, recommendations and are confident enough to express those ideas. At junior levels they are unafraid to speak up. As they progress up the ladder, they learn their businesses well enough to make significant contributions. Their proposals are not always executed, but they are valued by co-workers and clients. They earn respect for thinking about their business and get promoted as a result.. Sometimes (all too often) people get hired because they have great résumés. But those résumés may have nothing to do with the business at hand. We have seen executives who have seemingly perfect experience flunk out in a new position because the experience they have has not prepared them properly to handle the issues that will confront them in their new job, despite what their resumes say.. This happens a lot when the underlying skills required to handle a job are not carefully defined up front so that candidates can be measured against that criteria. All too often people get promoted as a matter of convenience. I once had a job running an organization (not advertising). After many years in that position, I felt it was time to move on. No one in the organization was capable of handling the assignment, so the only person who volunteered to step up was incompetent. The board knew it and they gave it to him anyway. This often happens in ad agencies where a person simply outlasts his or her competition. And since the evil you know is better than the evil you don’t know, it is easier and more expedient to promote someone known rather than bring in a stranger. Management does this hoping that the person will grow into the job. Sometimes they do and sometimes they don’t. I wish life were just a meritocracy. But it doesn’t always happen that way. If it did we would have better leadership in every field of endeavor. Because of the number of comments I received from my previous post on Falling Up, I thought I would address the issue of both how this happens and why it takes so long to find some people out. Part of the answer can be found in the wonderful theorem written by Lawrence J. Peter called the Peter Principle. It is about people getting promoted to their level of incompetence. (Rather than write about it here, please go to the link.). Many empty suits simply push themselves beyond their own level of competence. This is particularly true of senior people. Previously, I received an anonymous comment about some executives whose strategies don't work. They are so bent on taking control that they fire the people who have knowledge and know-how to do the work. This leaves them in a position where their scheme backfires because the very people who they let go are the only ones who, with direction, might be able to handle their clients. And by letting them to, these executives have to do the work themselves. Often, they are incapable. I fully agree. I believe that what happens with many executives is that when hired, they create turmoil, intentionally or not.. Rather than studying and assessing the situation, defining the issues and developing a plan to address the issues they have found, many come in and immediately fire those who might be a threat. They bring in their own people. Their scheme is to surround themselves with loyal sycophants who will do their bidding. The havoc caused by this often lasts for more than a year and often obscures the issue of their own ability. When the smoke clears it can often be 18-24 months, especially if the person is a department head. It often takes management at least two years to begin to determine that the person they brought in cannot handle the situation. Because boards, if they function at all, only meet quarterly, it can take months before they actually define the problem – sometimes the senior people brought in are actually put on the board, so it takes even longer for the strongest board members to furtively meet and determine a course of action. I was once joined the board of a not-for-profit. It was losing money and, from the first board meeting I attended, I realized that the board was dysfunctional. I also knew I could fix it. It took me three years to become elected chairman. During the years before assuming power, I tried to define the issue. It took until I was made chairman to realize that I had to create a new board. An even larger problem than the incompetent board was that the executive director lacked the skills and interest to handle the issues confronting the organization. It took many months to resolve the problem because the first thing I had to do was change the board to get enough support to terminate the executive director. Ad agencies are no different. They have the added issue that they are always worried about about clients being upset by change.It can often take management a long time to work up the courage to discuss the impending changes with clients. My observation is that, ironically, most of the time when the change is initiated, clients express their support for the agency. The point is that it may take three years to define the problem and then it can take another year (or so) to resolve it. Often, in order not to lose face, rather than firing incompetent senior executives, agencies will tell these people to look for a job. (Of course as recruiters, we almost never find that out.). By doing this, the agency has time to look for a replacement, but that, of course, generally leaves the ineffective executive in place during the search. It takes most senior executives a long time to find a job. Over $200,000, the pyramid gets narrow. And most senior jobs come with very specific background requirements. So it often takes these people a year or two (or longer) to find a job. It generally takes four to eight months to replace a senior executive. Why so long? I recently placed a CEO. After he was identified, which took only two months, it took almost two months to negotiate his contract and then a while to extricate himself from his then current company (often senior people have agreements requiring six weeks or longer of notice period before leaving). These things just take time. Junior people take less time, but as everyone knows, it can take eight to twelve weeks tojust find and hire an account supervisor. I have wanted to write this blog for a long time; I first mentioned it a few years ago in a post about interviewing. The concept of falling up in business is not my own. It belongs to the late James Michaelson. Most of you won’t know him. Jim was the original new business person. He worked for Marion Harper, the founder of Interpublic, first at McCann and then at IPG. Jim went on to work for Jerry Della Femina, Ammirati & Puris and a host of other agencies. He used that description to describe a person who he had worked with and for who he did not particularly like or respect. Obviously. But it is a great concept. 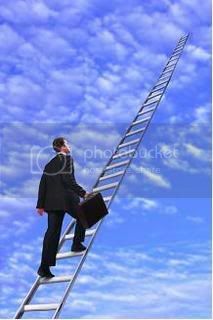 It has to do with empty suits, some of whom are highly successful, who keep climbing the ladder of success despite dubious achievements. There are lots of people in business like this. They look good, they talk good, they manage up well. They get promoted. They take credit (sometimes due, sometimes not). They often achieve great positions. The person who Jim Michaelson was talking about became president of a big agency. He was always in the right place at the right time. He was an account guy. When he joined each company his creative partners initially loved him, because he was trained at the right agencies, looked good and said all the right things. It always took about three to five years to discover that he was an empty suit. He rarely got fired, because that would cause bad publicity, but he was often told to look for a job. Each successive agency was impressed with his background; he got hired because of his résumé. (I have often cautioned about simply hiring a résumé, but it happens all the time.) Each time, this executive was hired, he got a better title and more pay. Ultimately, he got found out. Today he is out of the business. How many people like this do you know? The reason that the mergers don’t work is because they are not thought out, are not strategic and the dominant company rarely pays attention to the cultures and people of the acquired company. The holding companies primarily buy agencies to increase revenues. The rest be damned. Prior to the mid-to-late 1980’s (when the holding companies formed), many mergers and acquisitions actually worked. Those acquisitions were thought out on the basis of need. Look at the purchase of Myerhoff Advertising in Chicago by BBD&O (as it was then called) in 1979. At that time Mr.Arthur Myerhoff was in his late eighties and found it time to retire; he wanted to insure the continuance of his agency which had a long relationship with Wrigley gum. When BBDO acquired his agency, it moved Myerhoff intact into BBDO and his people ran the Wm. Wrigley account with little interference from the acquiring agency. Over time Myerhoff slowly merged into the agency. Wrigley continues there to this day, more than 30 years later. Prior to the publically held holding companies, mergers were managed carefully to insure that accounts and people stayed. When buying and merging ad agencies, there is no interest or attention paid to culture. The result is upheaval. The turmoil caused by merging usually results in unhappy people at all levels. Unhappy people make for unhappy clients. Unhappy clients put their accounts in review. While there are some back office savings, mostly those are offset by account defections. Advertising and creativity are all about people working together. It is still a business about people. And the one thing missing from 99% of today’s mergers is people and culture. And that is the critical part of a successful equation. One of the best examples of this is in the early 1990’s when Interpublic merged the wonderful agency, Ammirati & Puris (BMW “The Ultimate Driving Machine", Burger King, Seiko) into the successful but troubled agency, Lintas. Lintas was a hardnosed package goods agency (Lever International Advertising Service). The merger was an unmitigated disaster. The price of the merger was that Ammirati, a purely domestic U.S. agency, took over the worldwide Lintas network. The two agencies were entirely unprepared for each other. The merger died in just a few years. IPG was forced to merge New York agencies, Lowe and Partners/SMS (Scali McCabe Sloves) into what was then called Ammirati Puris/Lintas. Within a few years that died, too. About three years ago, Lowe New York was merged into Deutsch which is now a “Lowe and Partners Company”. So Ammirati, Lintas, Lowe all disappeared from New York. Another great example is the Omnicom purchase and merger of Chiat/Day and TBWA in the mid nineties. Although both agencies were considered “creative”, their cultures were very different. The merger actually worked in Los Angeles because there was no TBWA office there so the culture and accounts were not disturbed. The two New York agencies were merged but never quite meshed (while it is officially TBWA/Chiat Day, most people still refer to the New York agency Chiat. Most advertising observers agree that TBWA/Chiat Day has never fared particularly well in Manhattan. All these agencies that I mentioned share one thing in common: their cultures never merged. And culture is everything. Advertising is a people business. Creativity is about people. There are dozens of these stories all with the same plot and ending. I have always believed that the only successful mergers and acquisitions are where there is equal diligence paid to both making sure the financials are right and to insuring that there are compatible cultures. Unfortunately, I can think of very few in the advertising business. I was just stumped by a question and would like share the issue and know your answer. A candidate called to ask me a question that I have never been asked before. She is recently engaged. Her question: “Should I wear my ring on tomorrow’s interview?” I was completely stumped. The first thing I asked her was whether it was large or not. She said it was large to her, but close to a carat. That is not huge or ostentatious in any way. I told her to wear it proudly and not be self conscious. Everyone, male and female, is used to seeing women wearing their engagement rings. It would never occur to me that her ring might negatively impact her interview.